Plot synopsis: The leader of a group of Irish Republicans is wounded during a bank robbery, and as he struggles to elude the police, his life slowly ebbs away. Based on a film of the same title, released in 1947.
Review: The film from which this episode is adapted is a classic, a rare example of British film noir. Its potential to be a great radio play as well is enhanced by the fact that Suspense employs - in the first version broadcast - the film's star, James Mason. Unfortunately, though, the story simply doesn't work very well stripped of its visuals. One of the film's great strengths is its arresting use of expressionistic cinematography, which obviously cannot be reproduced on the radio, so all we are left with is the basic story; and there's no getting away from the fact that, in this (heavily condensed) form, it isn't much good. In particular, for anyone who hasn't seen the film, the plot is probably more than a little confusing, as much of it is not clearly explained. Who is Mason's character, exactly? Why is he involved in a bank robbery? Where is he trying to escape to afterwards? Even the production has its problems; for example, the sound effect of running feet is - unintentionally - quite comical. All in all, a bit of a dud, and it's slightly surprising that a film that is more about mood and atmosphere than plot or dialogue would have been chosen to be adapted for radio in the first place. My recommendation would be to watch the film instead. Plot synopsis: A boxing manager, forced to surrender the contract of his star boxer as payment for a gambling debt, decides to take drastic steps to ensure the boxer doesn't leave the country before the debt has been paid. Review: The title of this episode is a play on John Steinbeck's Of Mice and Men, and there is a - fairly loose - thematic connection in terms of the fact that both stories are in sympathy with the Robert Burns' line about 'the best laid plans of mice and men' always going awry. However, unlike Steinbeck's novella, this is a very simple, pulpy tale, which offers little in the way of deeper food for thought. Peter Lorre is always good value - and is given the chance to deliver a few hysterical, over-the-top lines (such as those I quote above) - but there's not much to recommend it otherwise. The plot is fairly unexceptional and its mechanics over-laboured; most listeners will probably have tired of the story long before it reaches its conclusion. Plot synopsis: The wife of a pompous and egotistical foreign correspondent surprises him by asking for a divorce. Review: Unusually for Suspense, this episode is not a crime, horror or science-fiction tale, but a relatively straight drama about relationships (even if it does have a 'twist' ending). We are told at the beginning by William N. Robson - Suspense's producer at the time - that the story doesn't feature any murders (unless we include the murder of a marriage! ), which alerts the audience from the outset that this episode is going to be very different to standard Suspense fare. Unfortunately, this is not in a good way, as there is precious little excitement or tension in what follows. The performances by the cast are fine, and the dialogue is perfectly adequate, but these don't prevent the episode from being pretty dull. Yet as well as the story not being terribly thrilling, I had a real problem with the ending. So, yes, the character of the foreign correspondent is stuffy and arrogant, but - SPOILER ALERT! - the way that his wife and her lover trick him into granting her a divorce hardly seems fair, by getting an actor to pretend to be the subject of the wife's affections (even leaving aside the questionable way in which the actor plays his role, as a very broad caricature of a brash Texan). Furthermore, the wife's lover, who is the foreign correspondent's old army buddy of the title, comes across as cowardly, and far from honourable: rather than telling his friend outright that he wants to marry the latter's wife, he resorts to subterfuge and deception, while all along maintaining that he is his friend. Frankly, none of the characters emerges from the story as very likeable, which is a definite problem when it is plain that we are supposed to be rooting for the pair of lovers. Plot synopsis: A recently released convict turns to an old girlfriend for help after leaving prison, but to her great shock, he then kidnaps her daughter. Review: The problem with late-period Suspense episodes is not that they are all terrible (though some are) but that, more often than not, they nonetheless lack the imagination, creativity and high production values that made the series in its heyday so great. By the 1960s, it was painfully obvious that American radio could no longer attract the quality of talent it once did, either in front of or behind the microphone, meaning that very few actors or writers of radio drama were, to put it bluntly, even approaching the calibre of those of the 1940s and 1950s (with some honourable exceptions). This episode illustrates these deficiencies only too clearly. The story is ... adequate. The script is ... adequate. The performances are ... adequate. Yet nothing about it is any more than this. I doubt that anyone who listens to this episode will be anything more than passingly interested in how the plot plays out and many will probably be not a little bored. I certainly found it hard-going listening all the way to the end and anyone who starts but does not finish won't be missing much. Plot synopsis: With midnight of New Year's Eve 1961 about to arrive, what if the old year refuses to give way to the new? Review: An extremely slight, whimsical fantasy, this story has charm, but lacks anything approaching substance. The central conceit, that years are somehow conscious entities with characters and personalities, is a fun one, but once this has been established, there is not a great deal of plot to fill the running time. The idea that the year 1961 wants to carry on 'living' rather than make way for 1962 is wryly amusing for a while, but the story essentially runs out of steam about halfway through. A further problem is that there is never any doubt as to how the episode is going to end - hint: is it really going to stay 1961 for ever? 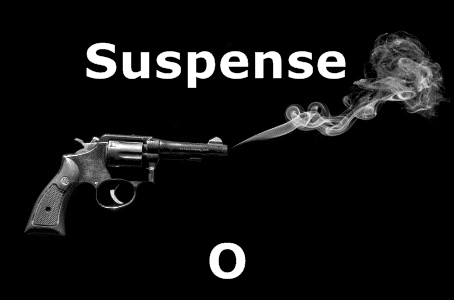 - so there isn't any suspense, either, something of a problem for a Suspense story ... Nonetheless, the episode is inoffensive and a passably entertaining listen. ​Plot synopsis: On a dark and stormy night, a couple's car runs out of gas on a deserted stretch of road, and their fear begins to mount thanks to a news report on the radio of an escaped madwoman in the area. Review: My synopsis above may make this episode's plot sound terribly clichéd - and, in many ways, it is. However, this may be because it is one of the first stories to use the broken-down-car-in-isolated-locale-with-an-escaped-madman-(or-woman)-on-the loose plot, meaning that the episode suffers the fate that befalls many 'pioneering' works of being followed by later copy-cats that dilute the impact of the original. This is also one of Suspense's most well-known episodes, but as with a number of others in this category (like Sorry, Wrong Number) it has perhaps lost some of its appeal to modern audiences thanks to changing tastes. As a broad generalization, I would suggest that listeners today are less impressed by the type of 'twist in the tale'-plotting many of these relied upon - personally, at any rate, my favourite episodes tend to be those that employ more subtle means to create their effects, such as those that explore the complex emotional and psychological states of their protagonists (see, for example, Mission Completed, The Too-Perfect Alibi or The Yellow Wallpaper). Still, to get back to this episode, there certainly is pleasure to be had here, especially in the second half when a third character is introduced into the mix. As she and the stranded couple into whose car she gets argue and bicker over what to do next, and who precisely the stranger is, genuine tension and suspense develops. And even though the ending is not as clever (or unpredictable) as the episode's reputation might suggest, it is still solid and satisfying. Finally, of the various versions of this story Suspense produced, I would recommend the first - all use very similar scripts, but the first has the major advantage of Cary Grant in the lead role, a fact which should require no further justification to explain my choice. Plot synopsis: A man suspected of the murder of a woman whose dead body he discovers comes up with a novel means of clearing his name. Review: To begin with, this episode feels as if it will be no more than a one or two star story; however, though it never becomes an absolute classic, it does develop into a much more interesting tale than it seems at first it is going to be. At the start, it appears to be a fairly mundane, not very engaging episode, but when the main character unveils his scheme for persuading the world of his innocence it suddenly turns into quite an intriguing one. I won't reveal what his means of doing this is, but since the episode is apparently based on a true story, real life can be thanked for the idea. As with many Suspense stories set in Britain, it is blighted by some terrible attempts at British slang – as well as very mixed performances – yet the conceit at the heart of the story remains clever and fascinating.